In 2003, there were four. Last year, 14 more than IP or med-mal. IN AMERICA, LAND of the free and home of the road-enraged, collisions in traffic are frequently followed by collisions in court. According to the National Center for State Courts, 60% of civil filings are for traffic accidents. These rarely go to trial and generally settle within 18 months for $30,000 or less, according to the center. So why have motor vehicle verdicts jumped from 4% of the top 100 in 2003 to 14% in 2004—equal to products liabilities verdicts and more than perennial big-dollar awards in contracts (11%), medical malpractice (13%) and intellectual property (8%)? "It could be a fluke," said Andrew J. Stern of Philadelphia's Kline & Specter. "But, in general, people are much more safety conscious.... When jurors have evidence there are defective conditions not being addressed, they have no tolerance." 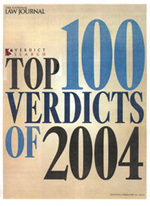 The vast majority of these cases are straightforward fender-benders, but the verdicts that made the top 100 required a high degree of expertise. Some challenged attorneys with problems of constitutional law and multiple defendants with varying degrees and types of liability. Stern won a $38.2 million judgment (No. 44 on the list) for Natalie Robley, who was left a quadriplegic when the car in which she was riding was struck at an intersection in East Lansdowne, Pa. Stern won a settlement from the car manufacturer, but sought damages from the municipality and the Pennsylvania Department of Transportation for failing to put a traffic light at the intersection—despite documented safety concerns dating back 30 years. At the time of the collision, it had a single stop sign. "What bothered the jury was not just that there was an accident, but that neither the municipality nor PennDOT had taken any action even though they'd known for years and years that the intersection was unsafe," Stern said. He is challenging the constitutionality of a state law capping damages. The year's largest motor vehicle verdict (No. 43) was a $38.3 million award won by Kevin P. Durkin, a partner at Chicago's Clifford Law Offices. The collision occurred on an Illinois interstate after a car involved in a minor accident neglected to pull off the fog-bound high-way. One truck after another came to a screeching halt. A car driven by Scott. Yoder collided with a jackknifed truck, killing Yoderr's daughter and leaving his son with irreversible brain damage. Assisted by associate John T. Karnezis, Durkin named nine defendants, including truck drivers and their employers, all of whom argued the accident was an act of God caused by the weather. Durkin countered with an expert on truck-driver training, licensing requirements and regulation. He testified that the drivers were trained to reduce speed to compensate for conditions. "You should educate before you litigate," Durkin said. "We set out to educate the jury how truckers are supposed to adjust for different conditions. The jurors came to their own conclusions that these trucks were operated irresponsibly."